Motto: "Unity, Strength and Endurance"
a. "National Song of Anguilla". Official Website of the Government of Anguilla. Archived from the original on 23 July 2011. Retrieved 10 July 2011.
b. For the Overseas Territories. The name Anguilla is an anglicised or latinate form of earlier Spanish anguila, French anguille, or Italian anguilla, all meaning "eel" in reference to the island's shape.For similar reasons, it was formerly known as Snake or Snake Island. Traditional accounts state that Anguilla was first colonised by English settlers from Saint Kitts beginning in 1650. In this early colonial period, however, Anguilla sometimes served as a place of refuge and recent scholarship focused on Anguilla has placed greater significance on other Europeans and creoles migrating from St. Christopher, Barbados, Nevis and Antigua. The French temporarily took over the island in 1666 but returned it to English control under the terms of the Treaty of Breda the next year. Attempts by the French to capture the island during the War of Austrian Succession (1745) and the Napoleonic Wars (1796) ended in failure. During the early colonial period, Anguilla was administered by the British through Antigua; in 1825, it was placed under the administrative control of nearby Saint Kitts.In 1967, Britain granted Saint Kitts and Nevis full internal autonomy. Anguilla was also incorporated into the new unified dependency, named Saint Christopher-Nevis-Anguilla, against the wishes of many Anguillians. This led to two Anguillian Revolutions in 1967 and 1969 headed by Atlin Harrigan and Ronald Webster. The island briefly operated as the independent "Republic of Anguilla". The goal of the revolution was not independence per se, but rather independence from Saint Kitts and Nevis and a return to being a British colony. 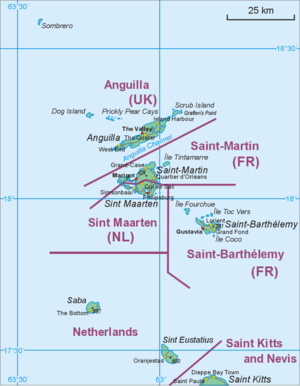 British authority was fully restored in July 1971 and in 1980 Anguilla was finally allowed to secede from Saint Kitts and Nevis and become a separate British Crown colony (now a British overseas territory). Northeastern trade winds keep this tropical island relatively cool and dry. Average annual temperature is 80 °F (27 °C). July–October is its hottest period, December–February, its coolest.Rainfall averages 35 inches (890 mm) annually, although the figures vary from season to season and year to year. Before the 2008 world-wide crisis the economy of Anguilla was expanding rapidly, especially the tourism sector which was driving major new developments in partnerships with multi-national companies. Anguilla's currency is the East Caribbean dollar, though the US dollar is also widely accepted. The exchange rate is fixed to the US dollar at US$1 = EC$2.70. Anguilla's financial system comprises 7 banks, 2 money services businesses, more than 40 company managers, more than 50 insurers, 12 brokers, more than 250 captive intermediaries, more than 50 mutual funds and 8 trust companies. Anguilla's tourism industry received a major boost when it was selected to host the World Travel Awards in December 2014. Known as "the Oscars of the travel industry" . Anguilla aims to obtain 15% of its energy from solar power so it is less reliant on expensive imported diesel. The Climate & Development Knowledge Network is helping the government gather the information it needs to change the territory's legislation, so it can integrate renewables into its grid. Anguilla is served by Clayton J. Lloyd International Airport (prior to 4 July 2010 known as Wallblake Airport). The primary runway at the airport can accommodate medium-sized aircraft. Although there are no direct scheduled flights to or from continental America or Europe however connecting service is available through San Juan ,St.Thomas and St.Maarten.Air Sunshine Offers service to St.Thomas(STT) ,San Juan(SJU),St.Maarten(SXM),Nevis(NEV). Dominica(DOM) on a regular basis and other destinations on demand. Aside from taxis, there is no public transport on the island. Cars drive on the left. There are regular ferries from Saint Martin to Anguilla. It is a 20-minute crossing from Marigot, St. Martin to Blowing Point, Anguilla. Ferries commence service from 7:00 am. There is also a Charter Service, from Blowing Point, Anguilla to Princess Juliana Airport to make travel easier. This way of travel is the most common method of transport between Anguilla and St. Martin or St. Maarten.